A while back I had tried out a small Spring Boot based sample with Scala as the language and found that the combination works out quite nicely - no big surprises there actually as Scala programs ultimately run in the JVM. I have now updated the sample with the latest version of Spring Boot and some of the supporting libraries. JPA annotations carry over quite well, one wrinkle may be the additional @BeanProperty annotation though, this is required for JPA implementations as this makes the scala compiler generate the normal Java Beans type getters and setters instead of the scala default getters and setters which don't follow the Java Bean conventions. There are some wrinkles here too but should mostly make sense, the way the repository is autowired is a little non-intuitive and the way an explicit Array type has to be provided for request mapping paths and methods may be confusing. 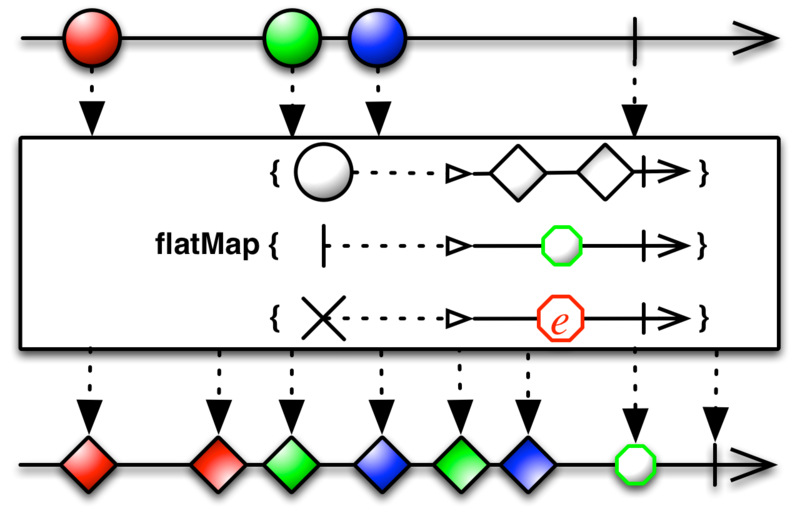 Given this, the flow in the test should become very clear - we start with an Observable which emits three values "Red", "Green", "Blue", the function transforms an element to another Observable, calling the flatMap now makes this mapping and flattens the result to an Observable. In conclusion, I really appreciate the effort that goes behind creating these marble diagrams by the authors of ReactiveX and feel that they clarify the purpose of the operations neatly.